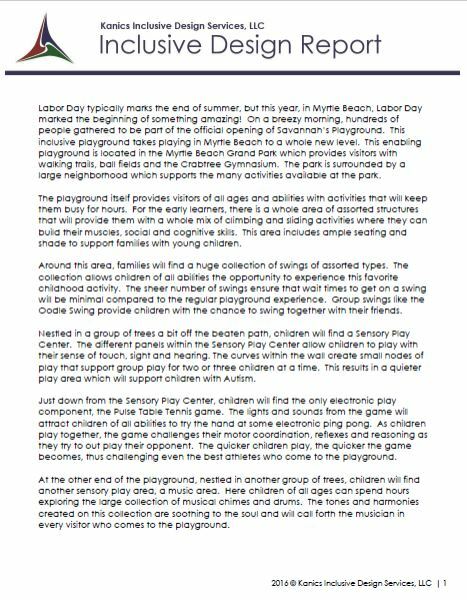 Labor Day September 3, 2016 marked the grand opening of Savannah’s Playground in Myrtle Beach, SC. Carolina Parks and Play were thrilled to be a part of opening this All New Inclusive Playground in honor of Savannah Thompson. During grand opening ceremonies for Savannah’s Playground, the crowd joined Representative Alan Clemons in proclaiming Saturday as Savannah Thompson Day. Several hundred people were on hand for the dedication of Savannah’s playground and honored Savannah for being such an inspiration to her community. Savannah invoked the vision for Mayor John Rhodes to create an Inclusive Playground in Myrtle Beach. Chris Skinner, a local dad who uses a wheelchair, explained that he can now play with his kids, thanks to Mayor John Rhodes, the City of Myrtle Beach and the inspiration of Savannah Thompson! 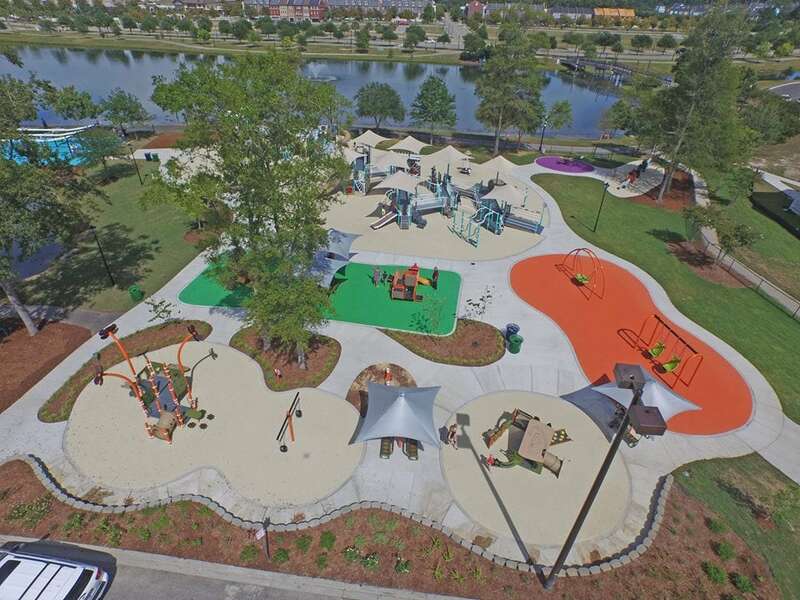 Savannah’s enabling playground is a significant part of Mayor John Rhode’s commitment to expanded recreational facilities for people of all abilities. The playground is adjacent to Crabtree Memorial Gymnasium in the heart of Grand Park, across the lake from The Market Common. As an inclusive playground, it is designed with ADA-compliant play structures and activities, allowing children of all abilities to interact with each other and do what all kids want to do: play. The playground equipment at Savannah’s Playground is manufactured by Landscape Structures Inc., the leader in the industry of Inclusive Playgrounds. Landscape Structures create playgrounds that are age appropriate, sensory stimulating and universally designed to make environments more usable, safer and healthier for all. 5-12 Ages: Large Swing Pod with 10 bays and two swings at each pod. Click here to read an Inclusive Designs Report on Savannah’s Playground authored by Ingrid M. Kanics, OTR/L, FAOTA, an expert on Inclusive Play. Ingrid is an occupational therapist who strives to help communities create and run amazing places where people with all abilities can play together. She became an expert on inclusive play after a spinal cord injury in the U.S. Army. An entrepreneur who owns Kanics Inclusive Design Services, LLC., she has earned a Master’s of Occupational Therapy and a Master’s of Interior Architecture. Her consulting business focuses on creating and operating inclusive indoor and outdoor play spaces. 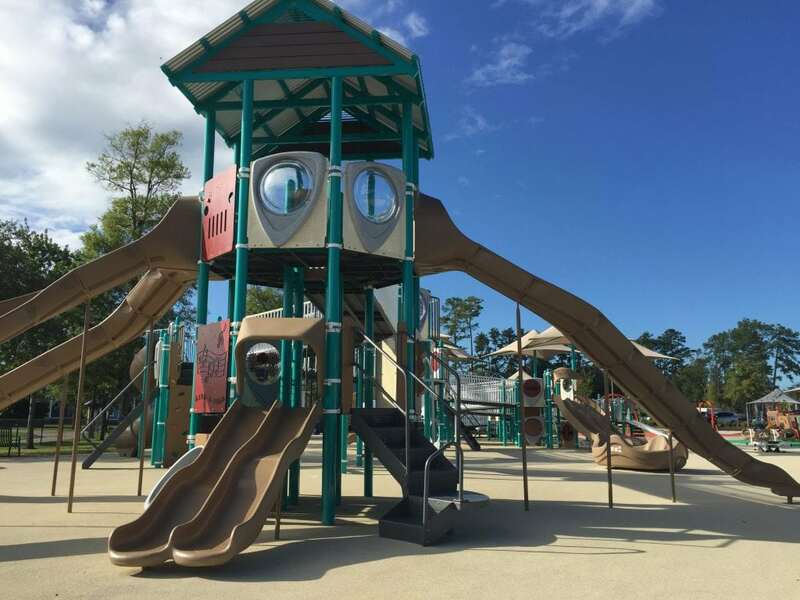 This inclusive playground in Myrtle Beach, SC is seriously impressive-it’s one of the largest of its kind in the region. We believe that Savannah’s Playground is a truly inspirational playground and a destination playground in the great city of Myrtle Beach! Click here to see our full photo gallery of Savannah’s Playground. Click here to request more information from us on Inclusive Playgrounds.